During a storm in northern Moscow. 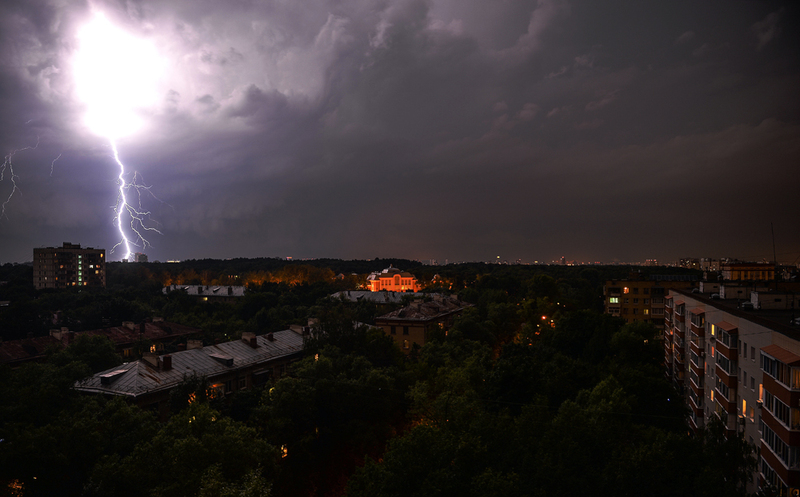 A severe thunderstorm swept through Moscow last night leaving at least nine people injured, downing over 1,000 trees and damaging over 120 cars, local officials said on July 14. "This has been the strongest storm over the past few years. More than 1,000 fallen trees will be removed by this evening. The condition of the nine injured is under control," Moscow Mayor Sergei Sobyanin tweeted. Wind gusts reached 21 meters per second. However, meteorologists said that this storm was not the strongest in Moscow’s history. According to the City Hall officials, some 1,000 vehicles and more than 1,500 staff are working on the clean-up. The thunderstorm also hit the capital’s suburb, the Moscow region, killing one and injuring 17 in its western part. More than 15,000 were left without electricity for up to four hours.